In the steps of KAMA SUTRA comes the newest Indian film which has caused scandals in the subcontinent! The hypnotising and exotic score was composed by the Indian film music legend A.R. Rahman, the „Jerry Goldsmith“ of India. Director-writer Deepa Mehta has captured the shifting landscape of the entire Indian subcontinent, where both men and women are caught in the immense tension between the continuity of the extended family and desire for greater freedom and independence. Sita is a perfectly conventional young woman who gets trapped into a far from happy family. When she and her sister-in-law, both rejected by their husbands, bond in the face of mutual respect and misery, it is Sita who is young enough, sufficiently unhappy enough and open-minded enough to act upon the growing sexual attraction between her sister-in-law and herself. Beyond depicting in the Indian cinema the unthinkable – a lesbian relationship – it reveals a tug between past and present beliefs and values that must affect the lives of millions, especially women, entrapped in an oppressive patriarchal society. Heightening the drama throughout is A.R. 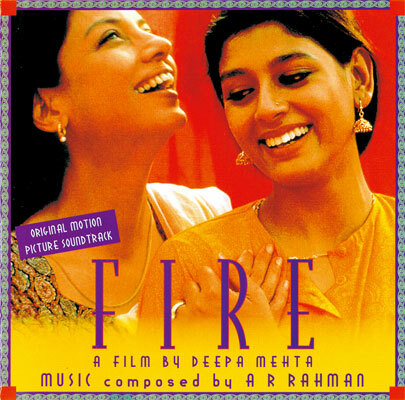 Rahman’s shimmering and spell-binding score.. Lusciously photographed and passionately told, FIRE ignites the senses as well as the emotions.